5 x 3: Fifteen Books by Three Great Armenian Writers offers summaries, commentaries, and anecdotes by Paul R Ignatius on a selection of works by Leon Z. Surmelian (I Ask You, Ladies and Gentlemen, 98.6, The Daredevils of Sassonn, Apples of Immortality, and Techniques of Fiction Writing), Michael Arlen (The London Venture, The Green Hat, Hell! 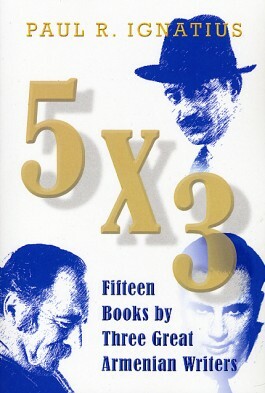 Said the Duchess, Babes in the Wood, and Man's Mortality), and William Saroyan (The Daring Young Man on the Flying Trapeze, Inhale & Exhale, Three Times Three, My Name is Aram, Sons Come & Go, Mothers Hang In Forever), three major twentieth-century Armenian authors writing in English. Mixing the keen observations of an astute and experienced reader with the personal observations and witty asides of a born raconteur, Ignatius brings a fresh perspective to hooks that are both familiar and obscure.